There is a hidden danger spot in most homes today. Chances are you don't look at it or even think about it. It's the vent from your clothes dryer. Over time, it fills with lint that slips past your dryer's filter and builds up in the hose and pipes that vent the warm air outdoors. 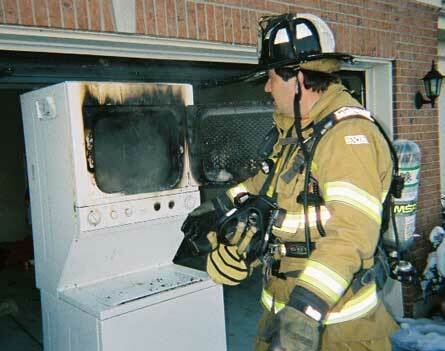 As the flammable lint builds up it can become a fire hazard in your home that can ignite at any time.A dryer with restricted airflow also runs significantly longer, causing utility costs to rise, increasing the need for repairs and decreasing the life of the dryer. By cleaning your dryer vent, we can help ensure your clothes dryer is both safe and energy efficient. There is a hidden danger spot in most homes today. Chances are you don't look at it or even think about it. It's the vent from your clothes dryer. Over time, it fills with lint that slips past your dryer's filter and builds up in the hose and pipes that vent the warm air outdoors. As the flammable lint builds up it can become a fire hazard in your home that can ignite at any time. A dryer with restricted airflow also runs significantly longer, causing utility costs to rise, increasing the need for repairs and decreasing the life of the dryer. 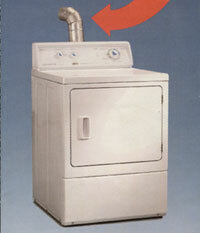 By cleaning your dryer vent, we can help ensure your clothes dryer is both safe and energy efficient. There is a hidden danger spot in most homes today. Chances are you don't look at it or even think about it. It's the vent from your clothes dryer. Over time, it fills with lint that slips past your dryer's filter and builds up in the hose and pipes that vent the warm air outdoors. As the flammable lint builds up it can become a fire hazard in your home that can ignite at any time. *Technician removes and cleans lint trap. *Technician takes the measurement of airflow using an air flow meter at the exterior dryer vent. *The back of the dryer is topically cleaned, as this is where lint can accumulate. *The HEPA vacuum system is connected to dryer vent duct. 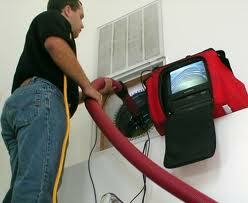 *Dryer duct auger is run through the duct to remove any blockages. *Airflow is measured again to gauge improvement before and after cleaning. *The camera is used again for post cleaning inspection.